Left: The Duke and Duchess of Fife during their wedding. Right: the Duke and Duchess of Fife. 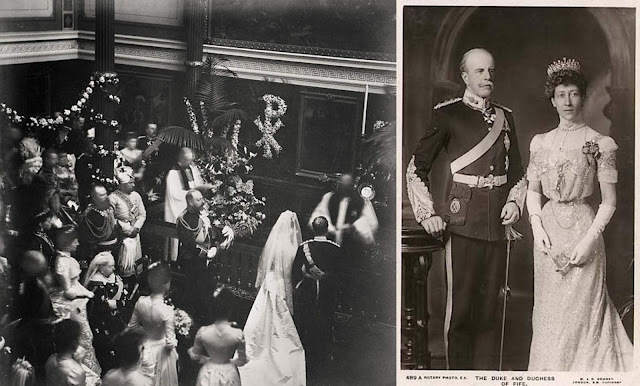 The marriage between Princess Louise of Wales and the Earl Fife was celebrated on July 27, 1899, at the Private Chapel in Buckingham Palace. An article on The York Times described the weather that day as "unpropitious," as it a rainy and gloomy. The event was not as grand compared to previous royal weddings. In fact, it was the first time that a royal wedding was held at the Private Chapel and there was only a limited number of guests in attendance. Despite the heavy downpour, nothing stopped the crowd from gathering the route from Marlborough House to Buckingham Palace to catch a glimpse of the royal bride. The Prince of Wales himself was "enthusiastically cheered." The Earl of Fife wore a Highlander's costume and the garter of the Duffs. He was accompanied by his groosman, Mr. Horace Farquhar (later First Earl Farquhar). During the wedding procession, Princess Louise was joined by her bridesmaids: her sisters Princesses Victoria and Maud of Wales, Princess Victoria of Schleswig-Holstein; and her cousins Princess Victoria of Teck, Countess Feodore Gleichen, Countess Victoria Gleichen, and Countess Helena Gleichen. Princess Louise wore a Duchesse dress made of white satin and a flowering train, trimmed with orange blossoms. She also wore a wreath of orange blossoms and point de gaze veil. Meanwhile, her bridesmaids were dressed in "blush pink faille and carried bouquets of pink roses." The ceremony was officiated a team of clergymen composed of the Archbishop of Canterbury, the Bishop of London, the Dean of Windsor, Domestic Chaplain of the Question, the Rev. F.A.J. Hervey, Domestic Chaplain to the Prince of Wales, and the Rev. T. Teignmouth. The Choir of the Chapel Royal St. James sang "Oh, Perfect Love." The wedding was also attended by government ministers, including Prime Minister William E. Gladstone. Queen Victoria wore black brocade, while the bride's mother, Princess Alexandra, wore pearl gray satin brocaded with silver and a diamond tiara. Two breakfast parties were held at Buckingham Palace after the wedding ceremony. One party were attended by the bride and groom, the Queen, and other members of the Royal Family. The other party was held in honor of the guests. After the breakfast, the bride and groom, together with the Prince and Princess of Wales, the King of Greece and the Crown Prince of Denmark, returned to Marlborough House. That afternoon, the couple proceeded to East Sheen Lodge, the suburban home of the earl, where they were given an enthusiastic welcome. "They passed between files of Venetian masts, decorated with floral festoons." The path was laid with carpet strewn with wildflowers by girls in white. In the evening, the vicinity of the earl's home was illuminated. A reception was also hosted by the Prince of Wales at Marlborough House, with over 1,000 guests in attendance.